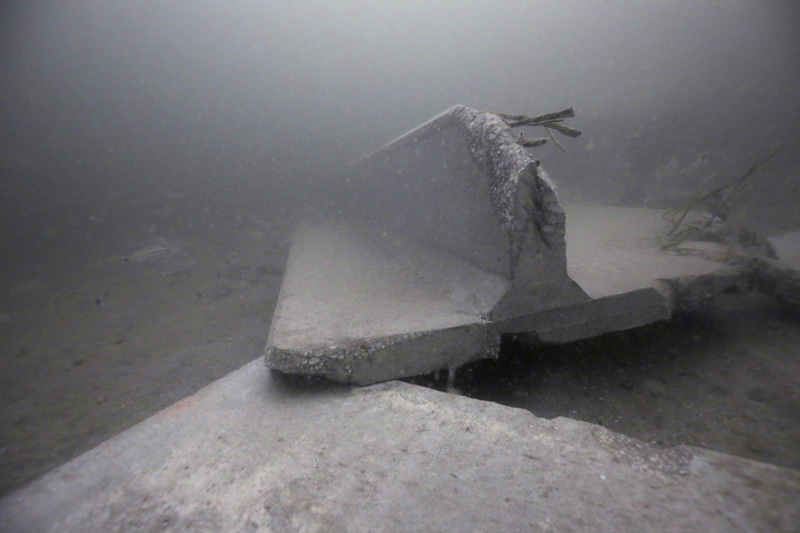 The Starship reef was created using approximately 1200 tons of clean concrete material off the coast of Jacksonville Florida in October of 2018. The Coastal Conservation Association (CCA) and Building Conservation Trust (BCT) initiated and funded the entire project. 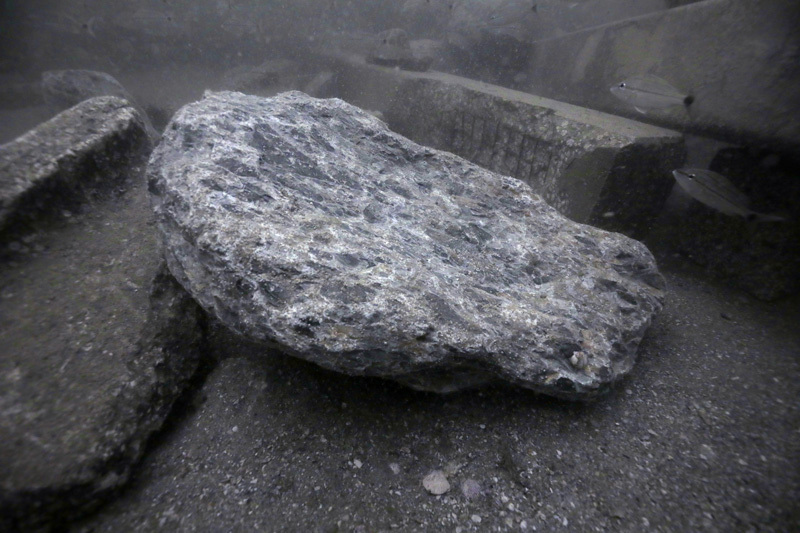 The reef material was placed within the Floyds Folly permitted boundaries (Permit SAJ-2007-261) at an average depth of 72 feet. The Starship reef deployment areas were located, surveyed, and mapped on 10-29-18 (less than 10 days from the final reef deployment). 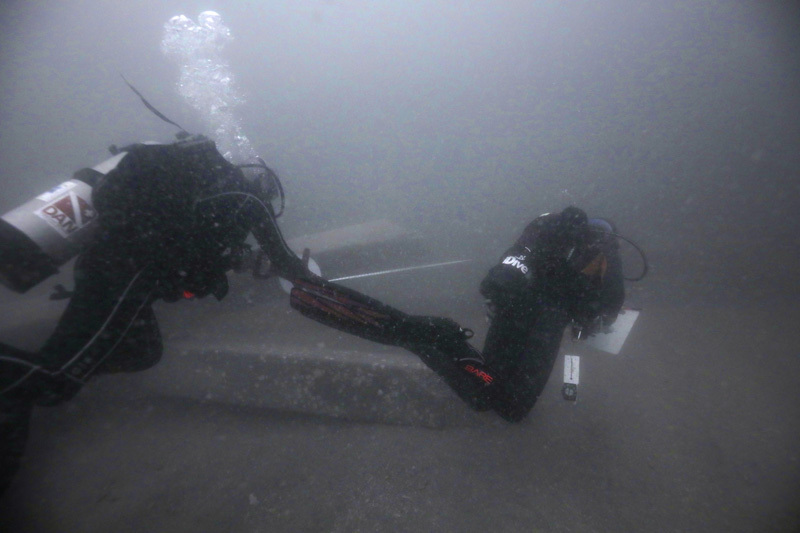 Divers that participated made general observations and swam prescribed radial headings sketching material layout along their path. Reef material was found dispersed in a random and sporadic fashion with both densely clustered congregations as well as isolated pieces. Some fish species were observed as well as a few mobile invertebrates. 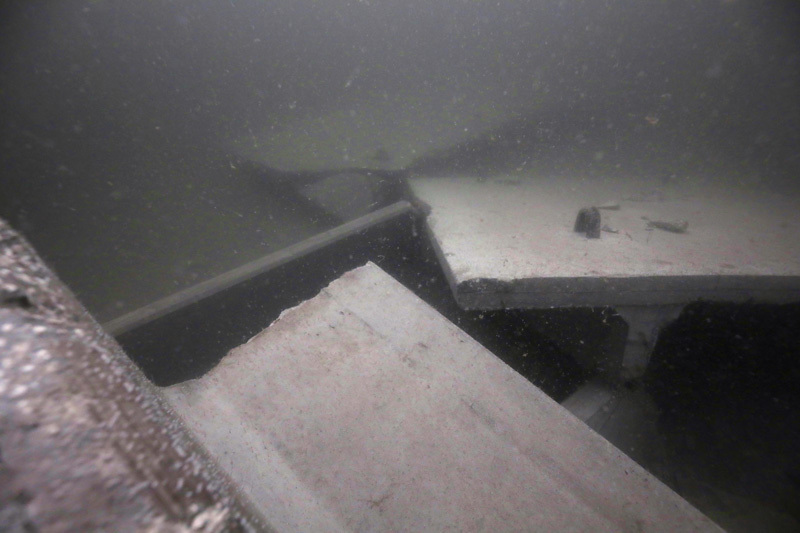 The reef was placed well within the permitted boundaries and the maximum vertical relief from the seafloor was below 50 feet from the surface. The reef deployment appears to meet regulatory requirements and should evolve into productive marine habitat. This project involved two separate barge loaded deployments using the same 140’ X 40’ ABS barge. One deployment was made on October 13th and the other on October 20th. The two deployments were made within very close proximity to each other but the resulting reef footprints are separated by a minimal distance. The methods described below were applied to each deployment site. The goals of the post deployment survey included mapping the overall material layout and making note of the material orientation. The reef site would have to be located, but to better aid in mapping efforts a center location of the scattered material was attempted to be located. A central location would provide an ideal benchmark serving as a fixed location in which survey observations could be referenced to. 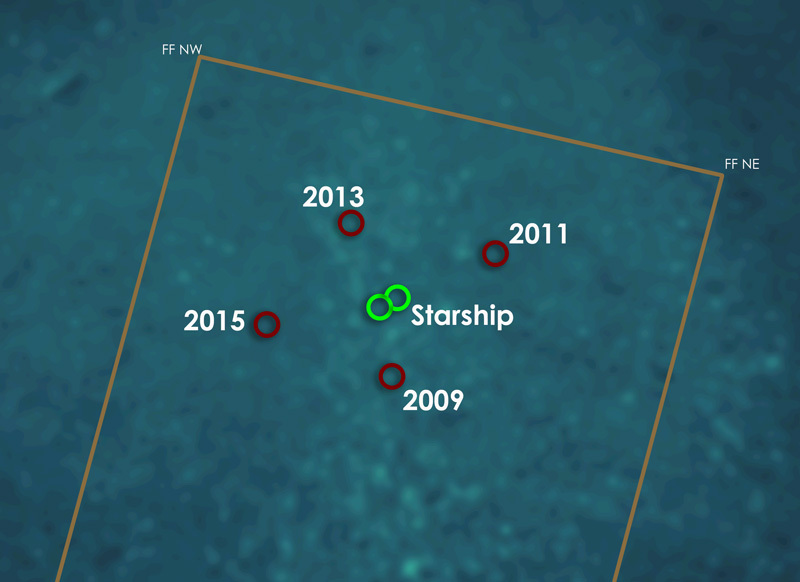 Figures 2 and 3 below show the Starship reef/s position in reference to the entire Floyds Folly permitted area and the nearby artificial reefs. Figure 2: Green circles are the Starship reef deployment areas and the red shapes are pre-existing artificial reef sites. 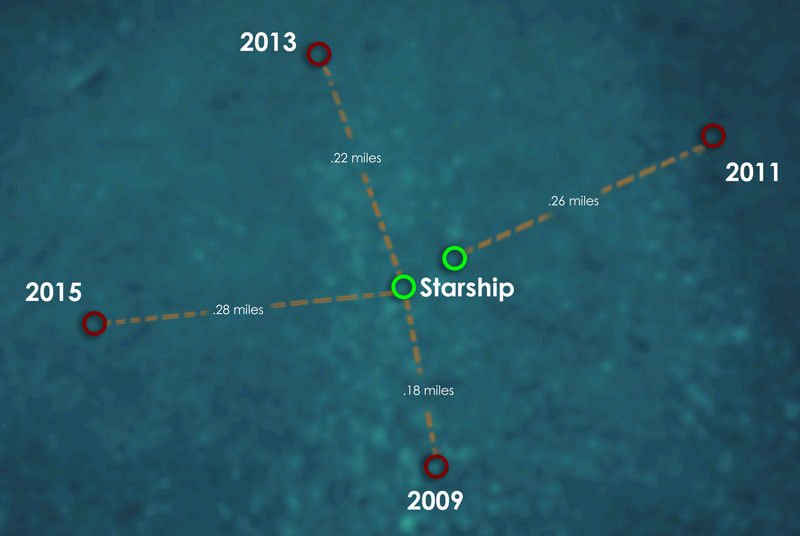 Figure 3: The 2018 Starship locations are roughly within 0.25 miles from existing reefs within FF boundaries. The Starship reef locations are nearly in the center of the existing artificial reefs within the Floyds Folly permitted boundaries. The dive vessel attached directly to the benchmark mentioned previously. 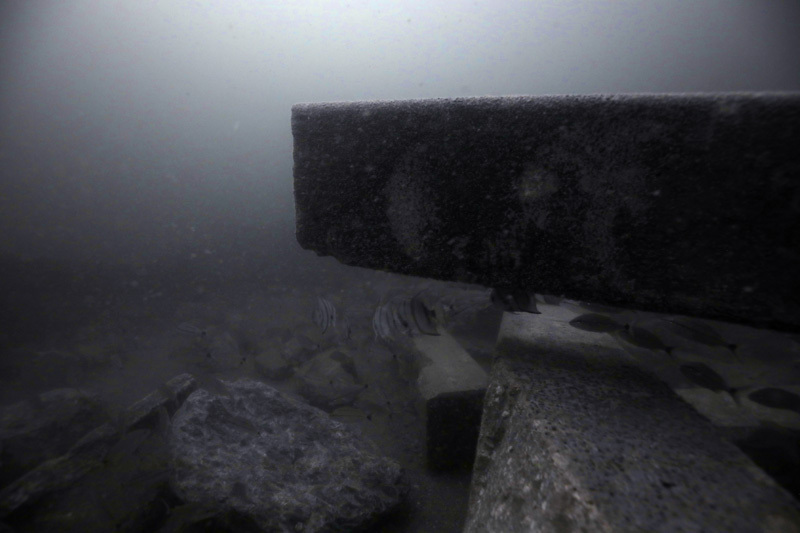 This allowed the divers the convenience of descending directly to the benchmark. This benchmark is defined as a fixed reef point location in which all measurements and observations are made in reference to. Scuba diving surveys of the reef were conducted to collect map and observational data. Dive teams attached measuring reels to the benchmark and swam a series of compass radial headings out to a distance up to 150 feet (Figure 4). 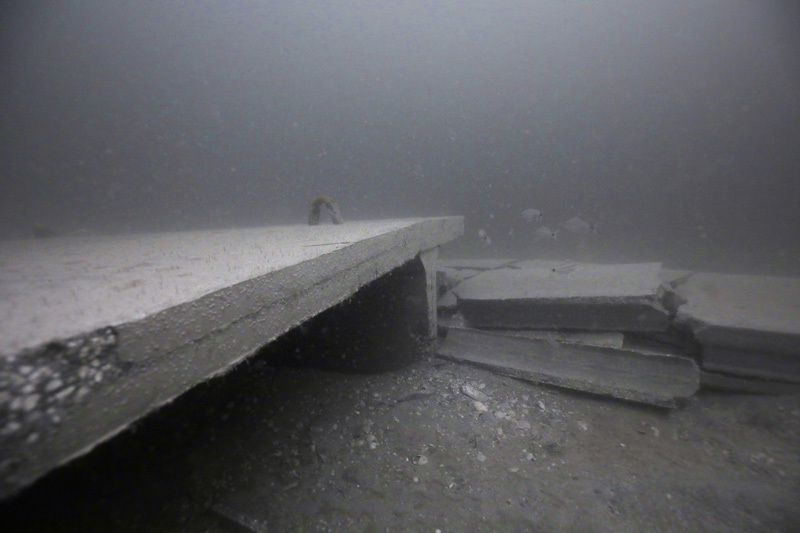 Divers noted material pieces and structural layout by drawing rough sketches on slates of what they encountered in reference to the radial line they were swimming. 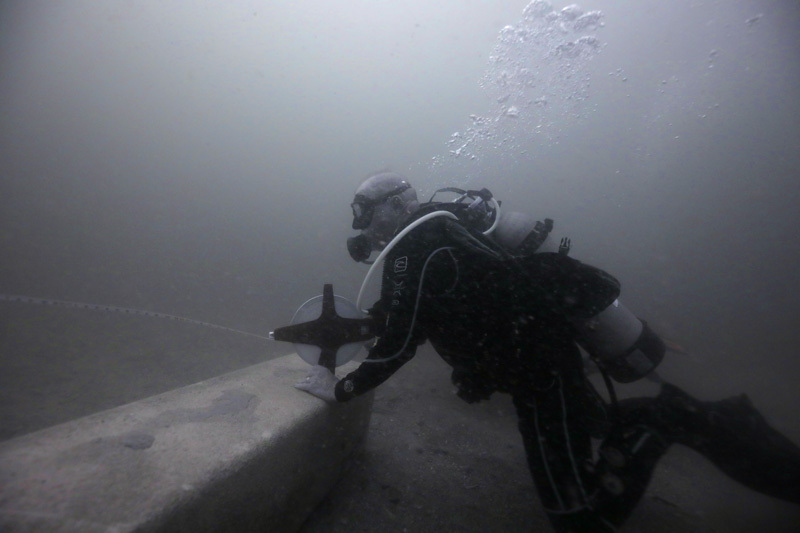 Divers also recorded the height of various structures and the marine life they encountered. Figures 5 and 6 below are scatter maps of each deployment area and show the reef material layout based on diver’s observations. The maps were generated based on divers best abilities to capture observation location data. Visibility conditions were limited and these maps should not be relied upon for underwater diving navigational purposes. The shapes shown on the map represent the various types of materials encountered and the relative position they may have been found. Surely not every piece of reef material deployed is shown on these maps but the illustrations allow a general idea of the material layout. The chosen benchmarks appear to have been a good approximate central locations. All the material observed was found within 100 feet from the benchmarks. 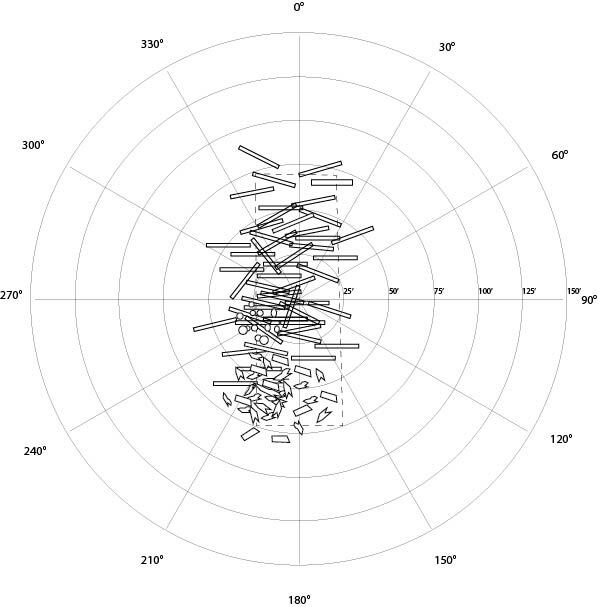 Structures were found clustered and sporadically dispersed within the 100 feet radius of the reef benchmark. During both deployments the barge stayed in a relatively stationary position. The resulting reef footprint seems to match that observation. The reef piles seem most concentrated within the dimensions of the barge with isolated pieces outside of that perimeter. 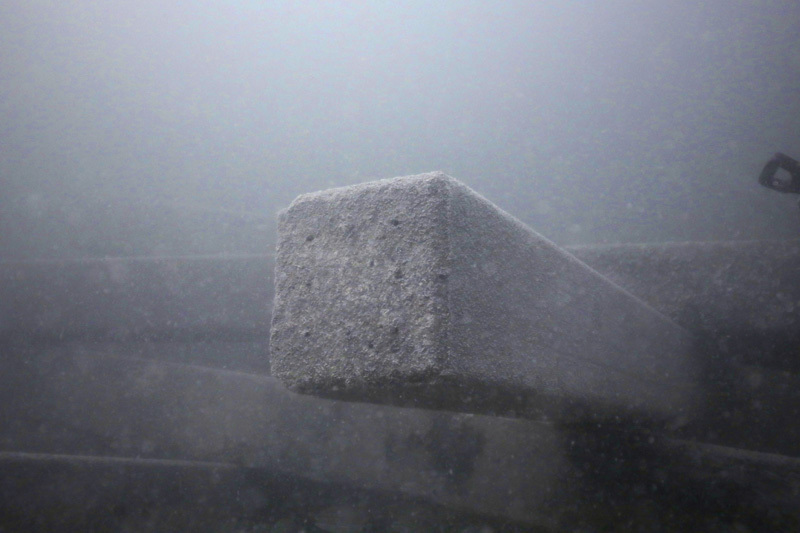 Based on the aerodynamic properties of the various concrete structures, it is expected that many pieces traveled some distances in horizontal directions prior to landing on the seafloor. 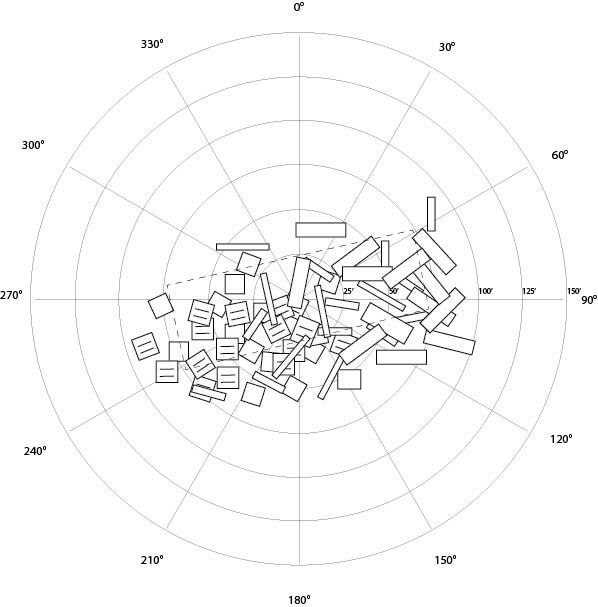 Figure 5: FF Starship 1 scatter map. Figure 6: FF Starship 2 scatter map. Material was found clustered in piles, lying flat, and in upside down and right side up positions. Most of the structures appeared intact but some pieces had been broken during the deployment. These broken structures provided interesting configurations and should add to the diversity of habitat. Some of the Shell rock pieces landed on top of other structures adding to the reef site complexity. The most interesting observation by the divers was the random stacking arrangement of the reef materials. 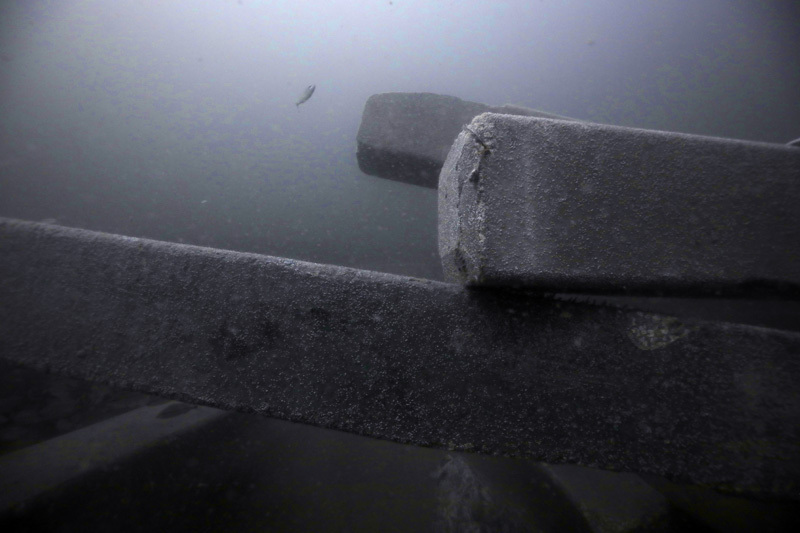 Pilings were found crossed on top of each other creating some impressive reef profile. The ledges and overhangs created should provide shelter resources for many marine animals. 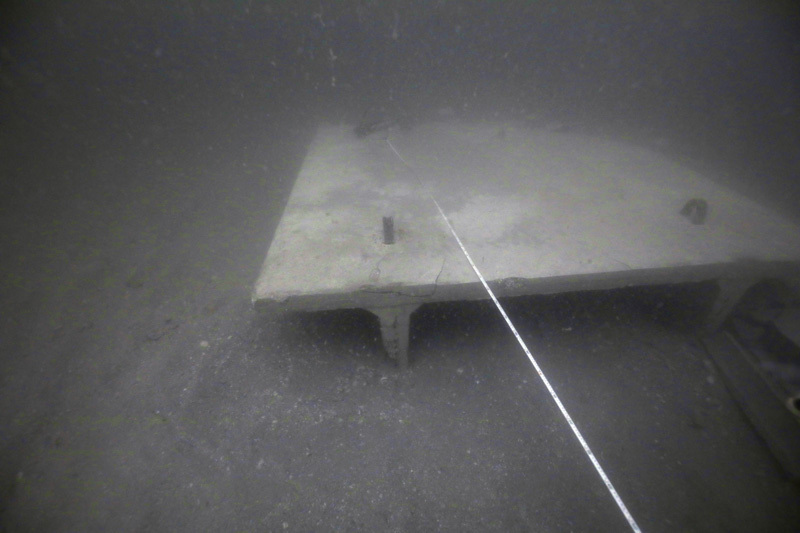 Other structures throughout the site ranged in heights from 2 to 8 feet off the seafloor. The extreme high pieces were the structures that landed on top of other structures creating a pile. Most of the material pieces were orientated lying on their longest side creating an overall average reef relief of 5 feet. 81°09.351 and 30°10.199' 81°09.305' have been created adequately. The area should evolve into thriving marine habitat and provide an additional resource to be utilized by the local community. -The entire reef is within FF permitted area (Permit # SAJ-2007-261). -No structures were found resting on existing live bottom. -Structures did not appear to have sunk or dug themselves dramatically into the substrate. -The highest area of relief was noted around 65 feet; within the 50 foot minimum requirement.